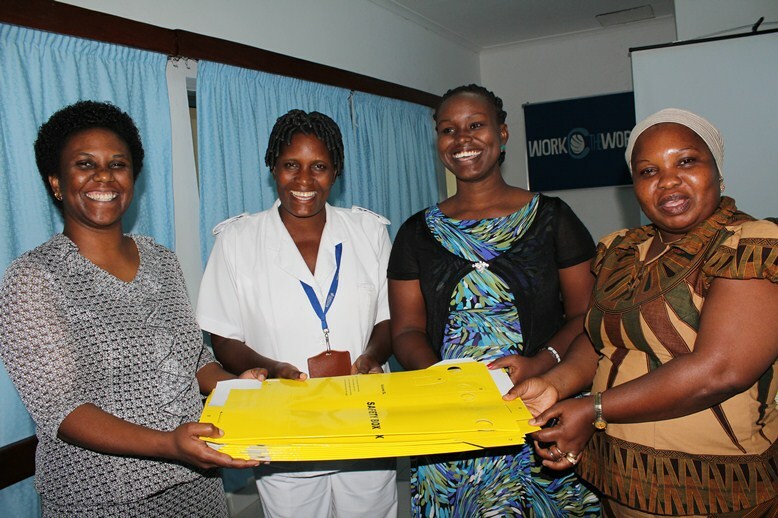 Jhpiego Infection Prevention and Control Senior Program Officer Lemmy Mabuga (L-R) hands over a donation of 600 safety boxes to Amana Hospital Matron Evelyn Rwezaula, Head of Quality Improvement Services Lucy Mbosi, and Hospital Administrative Secretary Tunu Mwanchali. Dar es Salaam, Tanzania—The situation at Amana Hospital, the referral center for Ilala municipal health facilities, had become dire. Because supplies of safety disposal boxes for used syringes and other injection materials had not arrived for weeks, nurses and doctors had few options to get rid of potentially harmful waste. “Sometimes we had to use empty glove boxes. Very dangerous, and risky,” added Emmanuel Maleshi, Nurse In-Charge of the labor ward. For a hospital that performs 120 deliveries and sees more than 1,500 clients every day, inadequate management, collection and disposal of sharps such as syringes and needles put health care workers, waste handlers and the community at greater risk of needle-stick injuries and possible transmission of infections such as hepatitis and HIV. Uncertain of when the next shipment of supplies would arrive, Mwanchalipicked up the phone and called Jhpiego, a trusted partner that has helped the facility improve their infection prevention practices. Jhpiego promptly donated 600 new World Health Organization-standard safety boxes—about a two-month supply. Safety boxes are specially designed to contain all contaminated sharps in one place and help prevent reuse. When the box is about three-quarters full, it is sent for incineration, never to be re-used. “When we received Amana Hospital’s request, we gave it high priority, knowing the risks health providers, clients and waste handlers are exposed to when waste management supplies such as safety boxes are out of stock,” said Lemmy Mabuga, Jhpiego’s Infection Prevention and Control Senior Program Officer. Jhpiego/Tanzania’s infection prevention and control program is funded by the U.S. President’s Emergency Plan for AIDS Relief though the U.S. Centers for Disease Control and Prevention, and provides technical assistance to the Tanzanian Ministry of Health and Social Welfare. Through this program, Jhpiego has helped Amana Hospital and 25 additional health facilities in Tanzania implement the Standards-Based Management and Recognition (SBM-R®) approach for improving the quality of infection prevention and control practices and provided key infection prevention equipment, such as color-coded waste bins, liners, aprons, gum boots, surgical gloves and caps, and more. Improving infection prevention and control practices in Tanzanian hospitals can lead to a reduction in the rate of biomedical HIV transmission and other infections, ultimately protecting health care providers and resulting in a healthier community.